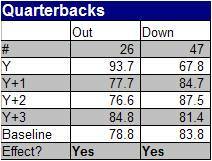 To say that Seahawks quarterback Matt Hasselbeck was a bust last year is an understatement. Hasselbeck had finished in the top six in quarterback fantasy points three of five years from 2003 to 2007; fantasy owners were expecting another good season, as he was drafted as the No. 9 quarterback in standard leagues. Injuries and poor performance plagued Hasselbeck. Just one year after throwing for career-highs in yards and touchdowns, he set career-worsts in passer rating (57.8), completion percentage (52.2), interception percentage (4.8), and yards per attempt (5.8). This year, despite his team’s acquiring former Pro Bowl receiver T.J. Houshmandzadeh, Hasselbeck’s average draft position puts him as the No. 15 quarterback. Should his regression affect his 2009 performance that much? Or is he the top-10 quarterback we saw in previous years? Naturally, this question applies to breakthrough performances, too. Panther’s running back DeAngelo Williams finished as the No. 1 back in fantasy with 1,515 yards and 18 touchdowns last year. He increased his yards per carry by 11.5 percent and his rushing touchdown percentage by 137 percent from his 2007 stats. Drafted on average as the No. 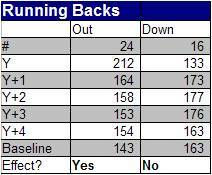 9 running back, the consensus is that Williams will fall back some from his 2008 numbers. Regression to the mean should obviously kick in for Williams, but it’s unseen as to whether his two good-not-great seasons will have any value in our 2009 ranking for him. Before any analysis, we must first define a breakout. My criterion for a breakout season is a 15 percent increase in fantasy points per attempt or reception—or quarterback rating—over their highest value in the previous two years, and a breakdown season is one in which there is a 15 percent decrease from the minimum value in the previous two years, while staying on the same team each year. For instance, there have been 37 running backs since 1980 to have a breakout season after two good-not-great seasons, as was the case for Williams; they saw a 19 percent drop in their fantasy points per carry (FPPC) the year after their breakout, regressing almost 75 percent back to their pre-breakout performance. Yet there’s a selection bias in that sample. Those 37 running backs’ fantasy points per carry was almost 30 percent higher than average in their breakout season, and we’d expect regression to the mean to kick in regardless of whether they broke out. So, I compared those 37 backs’ performance in the year after their breakout to a baseline performance: The next-year performance of all running backs with a similar FPPC average. That is, the next-year performance among all running backs since 1980 with a FPPC within 0.015 points of the FPPC average in the 37 rushers’ breakout season was nearly equal to the breakout-backs’ next-year performance—less than one-tenth of one percent higher. In other words, the fact that there was a breakout—as well as the fact that those 37 backs had almost league-average production in the two years before the breakout—made no difference in their next-year production. They would have regressed to the mean just as much if they had performed at their breakout level for three straight seasons. Let’s see how those numbers compare to other positions. To clarify my criteria, I looked at all quarterbacks with 150 attempts in three straight seasons and found all passers who had a breakout or breakdown season in either their first or third years. Players who fall under the “in the first year” status include Jim Kelly as a “breakout” (97.6 rating in 1991, followed by two near-80 ratings) and Ken Anderson as a “breakdown” (66.9 passer rating in 1980, followed by two above-90 ratings). 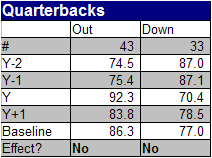 The first table below shows QBs who had a breakout or breakdown season—compared to the two seasons prior—as well as their post-breakout or breakdown passer rating, and the baseline performance (the average next-season rating of all QBs with a passer rating within five points of the breakout- or breakdown-season rating). What the table means: The 43 passers who broke out had a 74.5 rating two years before their breakout, a 75.4 rating one year prior to the breakout, and a 92.3 rating in their breakout season. The 43 passers had an 83.8 rating the year after the breakout, while the baseline performance was an 86.8 passer rating. That means that the 92.3 rating they had in their breakout season had no effect on their next-season rating; they regressed more than normal, since they had had two mundane passer ratings the two years before the breakout. The same occurs for breakdowns, though the difference isn’t as pronounced; because of the two good seasons prior to their breakdown, broken-down passers tend to bounce back more than a quarterback with similar stats. Let’s see how these stats compare to the quarterbacks whose breakouts or breakdowns came in the first year of a three-year stretch. There were 26 passers who posted a passer rating that was 15 percent greater than either of their next two seasons’ ratings. One season later, their collective ratings were six points higher than the baseline rating we expected. The 10 percent increase in passer rating from year three to year four is astonishing. The baseline performance is almost equal to the 26 quarterbacks’ weighted rating in those three years (weighting each season as half as significant as the next returns a 79.4 rating). Instead, it rises to 84.8, but that rise isn’t all credited to their breakout in the first year. 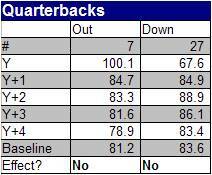 The two years prior to that “breakout,” the 26 quarterbacks had ratings above or just below 90. As for the 47 passers in the other group, their breakdown in the first year was a factor in their year-four passer rating. They had a weighted passer rating average of 83.9 in the first three seasons, which would have risen to 86.2 had they put up a rating of 84 in the first year. That’s a difference of 2.3 points—also the discrepancy between the baseline performance and their year-four passer rating. On the other hand, there’s no effect if I look at quarterbacks with a breakout or breakdown season in the first season of a four-year stretch (despite the small sample size). There were only seven quarterbacks who fit the breakout requirement; they had a decline in passer rating each year after their 100.1 rating. The 27 passers who had a first-year breakdown produced a year-five rating that was just fractions below their expected performance. The more attempts they racked up (in years two through four), the more we were certain that their true talent level was in the mid-80’s. Quarterbacks whose breakout or breakdown occurs in the final year of a three-year stretch regress more to the mean compared to a baseline expectation. The difference is equal to about two points of quarterback rating, with a larger regression for breakouts than breakdown performances. The 26 quarterbacks whose breakout came in year one had their rating drop 15 points, stay in the high 70’s, then regress back to the low-to-mid 80’s. Their up-and-down performance leads to a valuable notice: We always expect that a player’s true talent level is equal to his sample performance plus a regression to the mean. Quarterbacks who have a breakdown season in the first year of a three-year stretch have a more dramatic decline after the third season than their baseline, owing to the breakdown performance; if those passers had a passer rating of 84 instead of 67.8 in the first season, we would expect their fourth-year production to be equal to that of the baseline. 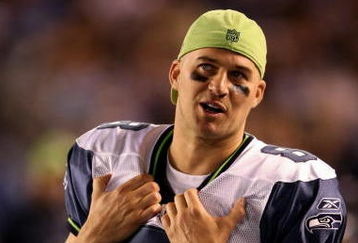 2009 cases: Matt Hasselbeck, third-year breakdown. Let’s see how the quarterback data compare to running backs. Only running backs that had 100 carries in three straight seasons are included. Fantasy points per attempt are prorated to 250 attempts in the tables below. While it seems surprising that breakout rushers performed to their expectation the next year, the 37 backs had such a large increase in fantasy points per 250 attempts (FP/250) in their breakout season (29 percent) that their weighted FP/250 is 174, enough to suggest that the remaining 13-point decrease is from regression to the mean. Running backs that broke down performed eight percent better than their baseline expectations the year after their breakdown, jumping from 135 to 150 FP/250. Although their FP/250 fell two straight years, their weighted FP/250 (154) predicted otherwise. 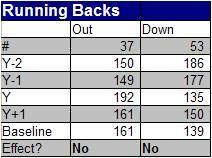 Now, what about backs whose breakout or breakdown came in the first year? The first year of the three-year stretch affected both groups of running backs, though it wasn’t as profound for the breakdown group. The 52 breakout backs had a five-point increase from the third to the fourth year, while the baseline suggested a five-point drop was in store. Again, the weighted average (157) predicted their next-season performance better than the breakout itself. Running backs whose breakdown occurred in the first year of a three-year stretch had a 13 percent drop in production from the third to the fourth years. That, however, isn’t such a large decrease, since the baseline was an 11 percent drop. That said, the three-point difference in FP/250 is hardly significant. When we look at four-year stretches with a first-year breakdown, the final-year FP/250 is equal to the baseline performance, at 163 FP/250. The 16 backs that apply had 133 in their down year, followed by three years of FP/250’s in the 170’s, and then 163 a season later, as shown below. A breakout or breakdown in the final year of a three-year stretch has no extra effect on a running back’s future production, compared to a baseline expectation. 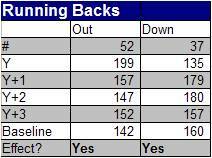 Breakout backs performed to their baseline, and breakdown backs had 11 more FP/250 than expected. When the breakout occurs in the first year, however, there’s a 10-point difference that is clearly influenced by the first-year 199 FP/250 rate. There’s no evidence that a breakdown in the first year has any effect on the year-four FP/250. 2009 cases: DeAngelo Williams (third-year breakout); LaDainian Tomlinson, Marion Barber, Joseph Addai, and Fred Taylor (third-year breakdown); Maurice Jones-Drew, Barber, Frank Gore, Steven Jackson, Clinton Portis, Larry Johnson, and Willie Parker (first-year breakout); Williams, Ronnie Brown, and Chester Taylor (first-year breakdown). 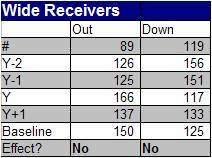 How do the receivers stack up? I looked at wide receivers and tight ends with 30 receptions in three straight seasons, and the results aren’t shocking. Here are the data for breakouts and breakdowns in year one. Fantasy points per catch is prorated to 70 receptions (FP/70). Breakouts and breakdowns for receivers aren’t much different from quarterbacks and running backs, and the disparity between actual and expected performance is much greater for wideouts. The 89 breakout receivers were 13 points worse than their expectation, which was also nearly equal to their weighted average FP/70 of 149. Those 89 receivers had a 17.5 percent drop in production from their breakout season to the next, compared to their expected drop of 9.6 percent. The breakdown group reminds us that a weighted average of past performance is always more accurate for future forecasts than one year alone. Their 117 FP/70 in their low year was expected to be followed up by 125 FP/70, but their three-year weighted average of 133 FP/70 was right on the dot. And the next table shows data for four-year stretches. Both tables tend to agree on first-year breakouts; each suggests a three- or seven-point difference in FP/70 between actual and the baseline performance. But it’s the breakdowns that are fascinating. One table—the three-year stretch—says that receivers with a first-year breakdown perform five points worse than the baseline. The other, though—looking at four-year stretches—says that the same receivers produce four points better than expected. We’re arguing semantics, however. Both tables are most likely correct, considering the samples they use: If a receiver has three good seasons after a bad year, the down year (which is four years ago) is outnumbered by the good years and has so little weight in determining the player’s true talent level. Chances are his true talent lies closer to the three stellar years as opposed to the poor season. Third-year breakouts and breakdowns for receivers have much less weight compared to other positions in their future production. As always, a weighted average of past production is better at predicted next year’s stats than on season (the breakout or breakdown) alone. Wideouts with first-year breakouts perform about three points better than expected. Those with first-year breakdowns, though, tend to play better or worse than expected, based on which group you’re looking at. With just two seasons of data after a breakdown, receivers perform five points worse than the baseline, but they are four points better than expected with three years of stats after their breakdown. 2009 cases: Derrick Mason, Deion Branch, Steve Smith (NYG), Mark Clayton (third-year breakout); T.J. Houshmandzadeh, Chad Ochocinco, Plaxico Burress, Dallas Clark, Chris Cooley, Heath Miller, Desmond Clark (third-year breakdown); Santana Moss, Josh Reed, Clayton, De. Clark, Owen Daniels (first-year breakout); Andre Johnson, Greg Jennings, Kellen Winslow (first-year breakdown, three-year stretch); Ike Hilliard (first-year breakdown, four-year stretch).